Do you have a child that suffers from allergies? Do you suffer from allergies? Are you suffering from an autoimmune disease, Asthma, or are receiving chemotherapy? HAVE YOU CONSIDERED DECORATIVE CONCRETE FLOOR RESURFACING? DID YOU KNOW THAT CONCRETE FLOORING IS THE #1 HEALTHIER HOME LIVING ENVIRONMENT? … today’s consumers are actively seeking alternative types of flooring that promote a healthier home environment. This is of critical importance that those suffering from allergies, immune deficiencies, and certain types of diseases eliminate the common sources and habitats of germs, bacteria, mold, dust, and soot mites, along with microorganisms that lie in silent wait. Seamless, non-porous, “sustainable” flooring and coatings such as Decorative Concrete represent a valuable means to effectively control contamination due to their ease in cleaning and disinfecting. Non-sustainable traditional flooring … carpets, grouted tile, seamed vinyl, or any type of flooring that has joints/seams EVEN HARD WOOD… can lead to serious health related complications, perhaps even being of a “life and death” nature. #1 Decorative concrete flooring is seamless, non-porous, and SEALED. #3 Decorative concrete flooring offers “true freedom of color and individual design” … not limited to factory colors of traditional flooring. CALL US TODAY FOR YOUR ENDLESS OPTIONS! 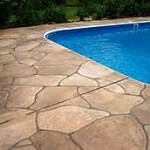 Stone Image Concrete Designs can provide your home with FDA certified Anti-Bacterial Epoxy flooring. #4 Concrete is a more energy efficient floor … in the case of concrete homes with decorative concrete floors, properties owners insurance rate typically are 10-15% lower than stick built homes with traditional types of flooring homes, since concrete flooring will not ignite as carpet, vinyl flooring, and many other types of traditional floorings do. 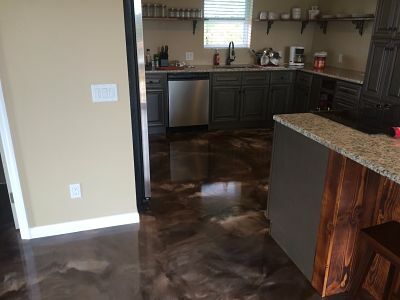 The above are but just a few of the reasons for selection of decorative concrete floors, which has advantages that cannot be matched by typical types of flooring. Installing concrete decorative resurfacing into your home will not only increase your health but lower your insurance rate!